From NYT bestselling authors Becky Albertalli (Simon vs. The Homo Sapiens Agenda) and Adam Silvera (They Both Die At The End) comes a long-awaited collaboration about two very different boys who can't decide if the universe is pushing them together or pulling them apart. BEN thinks the universe needs to mind its business. If the universe had his back, he wouldn’t be carrying a box of his ex-boyfriend’s things. But when the boys have a chance meeting at the post office, they leave wondering what exactly the universe does have in store for them. What if - in a city of eight million people - they can't find each other again? What if they do ... and then can’t nail a first date even after three do-overs? What if Arthur tries too hard to make it work and Ben doesn’t try hard enough? A charming, sweet-natured love story between two very different boys...It's impossible not to root for Arthur and Ben and their many do-overs. -- "Publishers Weekly (starred review)"
This joyful romance is both sweet and substantial. -- "Kirkus Reviews (starred review)"
In the coauthors' capable hands, Arthur and Ben are distinct, empathetic heroes...A comforting exploration of self-discovery and self-creation. Albertalli and Silvera balance cynicism and starry-eyed optimism to paint an honest, compelling picture of adolescent romance...Part feel-good, part star-crossed, this seamless blend of the authors' styles will appeal to fans old and new alike. -- "School Library Journal (starred review)"
4.0 out of 5 starsThe type of diverse novel I've been longing to read. No hate. Just meetcute. This was such an adorable story. Arthur and Ben are deliciously, awkwardly cute. A realistic things-don’t-always-go-right sort of thing. ‘What if it’s us’ is everything I expected it to be. Well written characters, a meet cute oozing innocence, awkwardness and angst. I may have rated it higher, but in comparison to ‘Simon vs the Homo Sapien Agenda’ this didn’t hit me as hard... or have as much comedy. So it just missed out on a perfect score. But that is not to say that is any less of a captivating read. Four hundred pages and still ‘What if it’s us’ flew by. I was always eager to see where the next chapter would take me. The alternating perspectives between Arthur and Ben lead off on two different storylines that happened to intertwine more and more as the novel progressed without rehashing information as we head-jumped into each narrative. I will say that the writing style did not differ too greatly between each perspective – if it weren’t for chapter titles and references I would have difficulty discerning whose voice was whose. I’d love to have seen some idiosyncrasies, habits, common word usage and tone separate the two perspectives a little more. Arthur, the shorter college-bound nerd discovering his first love made me smile with his uncertainty in everything but love. His values in family and friendship. I think this is the first story where there is no bitchiness or bullying, so a surprisingly fun rom-com. It felt like Ben had the biggest journey in this contemporary; discovering things about himself through introspection, friends, and of course, Arthur. He felt more like the stoic introvert that finally comes out of his shell. All of the secondary characters had their own stuff going on too: getting together, breaking up, fighting, and supporting each other. I really loved this aspect of ‘What if it’s us’ and really fleshed out the narrative. It ends on the same note of the title as a question – like a true contemporary. One of hope that left me satisfied and hopeful myself. The pacing is fairly steady. It’s not a fast read, but definitely does not feel like its dragging. The perfect timing for this type of genre. Definitely recommend for lovers of stories of diversity, light romances, and New York City. 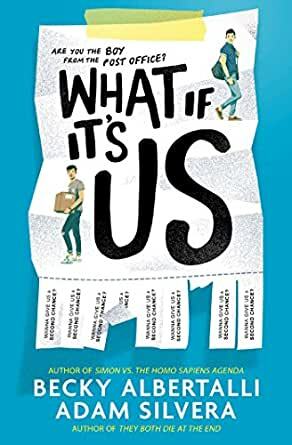 This story, which was authored by Becky Albertalli and Adam Silvera seamlessly intermingles the writing of both authors into one book which is insanely hard to put down. It was actually a struggle to stop reading this book for things like sleep, work and university. As soon as I could, I would continue reading this. The characters are quite believable, and have unique traits which enable the book to have emotional highs and lows. I found myself actually laughing and almost shedding a tear or two in some parts. I really hope this book has a sequel, as I want to learn more about Arthur and Ben’s lives and how they navigate their relationship. 4.0 out of 5 starsWhat is up with the ending? 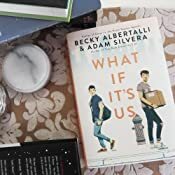 This co-operative novel by Beck Albertalli and Adam Silvera is a compelling read that really does look at the complexity of relationships and the forces in modern life that tear them apart. It was well written with credible and attractive characters whose motivations are understandable. An enjoyable experience with a credible ending. 5.0 out of 5 starsAmazing book! This book was absolutely amazing. The way it was put together. The characters. I need more Ben and Arthur! Most definitely worth the read. I received this book as an ebook from NetGalley in return for an honest review. Arthur James Seuss: a 5’6” Jewish kid with ADHD and the rage of a tornado. Ben Hugo Alejo: a freckle faced Catholic Puerto Rican. The book centres around both of these boys but you manage to love the secondary characters just as much as the main ones. "Dylan: On the sad scale, how are you feeling today? Opening-montage-of-Up sad? Or Nemo’s-om-dying-sad? There are also many references in the book too. Harry Potter, Star Wars, Lyft, Avenue Q, Titanic, The Fault in Our Stars and a few more. hears them and hopefully finally absorbs them! 7. Take people as they are! Not everyone from a certain race etc can speak the language or follows the religion etc. I also love that Juliet is biromantic ace. Plus I think the treasure hunt was probably my favourite part of the book. I’m a sucker for cute things like that.